So much food is sold on sentiment. Browse through any given sample of blogs, cookbooks and recipe columns and you’ll find stories steeped in nostalgia; the memories created by cooking, the promise of unforgettable experiences, the joy individual ingredients can bring.No-one knows this better than the ad men who work for global heavyweights like Nestle, Mars and Cadbury’s. Theirs is the chocolate that’s sold on a slogan – the sizzle not the sausage – working its way into our hearts and stomachs with messages that are striking in their simplicity. If we have a break, we have a Kit Kat, Crunchie has commandeered ‘that Friday feeling and a Yorkie is ‘definitely not for girls’ (although I wouldn’t say no to its manly chocolaty chunks). True, a Flake was sold as ‘the crumbliest, flakiest milk chocolate’, but anyone who watched those ads knows that the real sales driver was the sheer indulgence and secret pleasure it promised to women all over the country. Going back to the Rolo strapline, we’re presented with a pretty clear proposition; this is chocolate so good, you’d have to seriously love someone to share your last bite. Growing up with an older brother I learnt to safeguard my food from wandering hands, and understand how precious a commodity that final bite of anything can be. Whether it’s the crispiest chip, a crust of bread or a smudge of sauce on the edge of your plate, being robbed of that final mouthful can be a cruel and disappointing thing. Nowadays Rolos are a bit out of fashion. If you really loved someone, you’d probably be buying them Earl Grey infused truffles made from organic single estate cocoa beans, not thumbing them your last little chocolate cup from its tatty golden foil. But that doesn’t mean we should overlook the classic combination of chocolate and caramel; simple yet seductive, not daring, but delicious all the same. 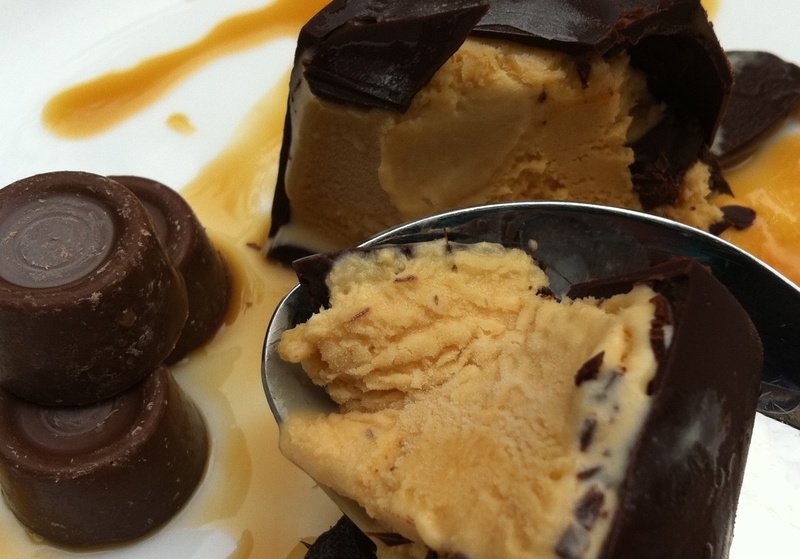 Can anything beat salted butter caramel ice cream cloaked in chocolate? So here it is, a Rolo for the twenty-first century. Salted butter caramel is stirred through creamy custard to create the richest, most delicious ice cream you’ll possibly ever taste. This is then poured into cups lined with dark chocolate, encased with an additional layer then sprinkled with fleur de sel. This is an ice cream with which people fall in love at first taste, and it’s a relationship built to last. If you love someone enough to make this for them, I guarantee that they will be unable to help but love you back. Would you give anyone your last mouthful? Would food would make to win someone’s heart? Do you have friends or family who like to pinch from your plate? And have you ever bought a product just because of the advertising? Melt 300g of the chocolate and 100g butter in a heatproof bowl over barely simmering water until smooth and glossy. Pour about half an inch of chocolate into the base of two deep silicon muffin cupcake trays (each with six pockets) and brush it up the sides of each pocket with a pastry brush until all sides are coated. Pop in the freezer to chill for 10 minutes, then repeat with a second layer of chocolate so you have a fairly robust shell. Return to the freezer. Make the ice cream according to instructions here, omitting the caramel praline so as to achieve a super smooth consitency (I couldn’t explain how to make caramel better than David Lebovitz, so I’m not even going to try. His recipe is spot on and pretty much foolproof, so use it). When the ice cream is churned but still soft, remove the muffin trays from the freezer and fill each chocolate-lined pocket to the top with ice cream. Depending on the size of your trays, you may have a little left over. If so, eat it (or freeze in a small tupperware). Return to the freezer. Melt the remaining butter and chocolate together. Allow to cool slightly, then remove your ice cream cups from the freezer and cover the top with a layer of chocolate, ensuring it reaches right to the edges. Return to the freezer for at least 30 minutes, or until ready to serve. To serve, push the individual chocolate cups out of the muffin pockets – they should pop out very easily with a beautiful smooth surface. Sprinkle with a little fleur de sel, if you like, and serve. The caramel in the ice cream keeps it beautifully soft, so when you crack through the hard chocolate shell, a velvety smooth ice cream is revealed beneath. I am drooling here at this brilliant icecream. 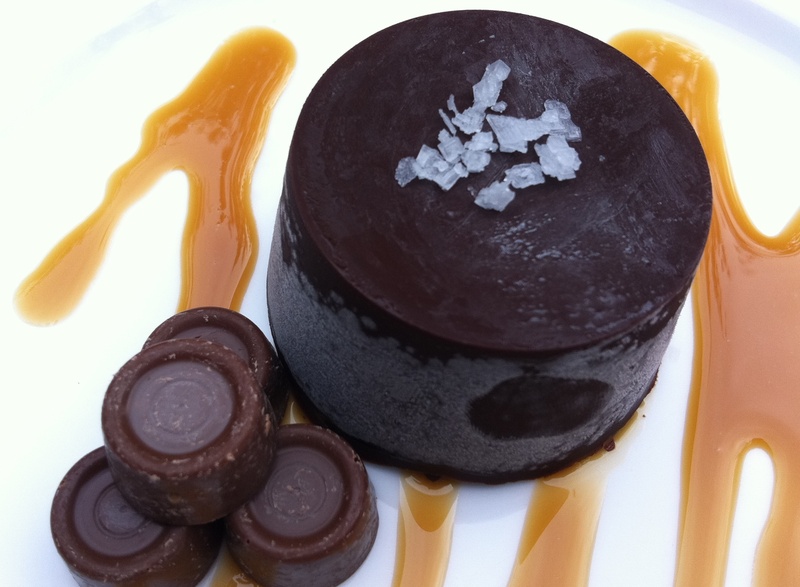 Love the idea of the chocolate cup and the salted caramel. Thanks so much for sharing. What a lovely idea! Nice to temper the sweetness with salt. wow this looks amazing!! I have really come to love the salted caramel and salted chocolate combination in recent times. Oh good lord! That is one of the nicest things ever. I think I would ilke to eat it on a stick like a very posh pop! No, I do not. what a FANTASTIC idea by the way! I love recreations or varieties of mass produced chocolate. I am loving this recipe, there can be no better combination of ingredients, amazing!! Janice – my absolute pleasure, it’s too good a recipe not to share! Baking Addict – it’s all about salty-sweet at the moment for me too. That is all, just. OMG. No wait, also WOW. AWESOME. INCREDIBLE. Savory Simple – that’s exactly what I thought when I first saw a recipe for salted caramel ice cream. Amy – I’m having so much fun with it. Got another idea up my sleeve but need to find the right moulds first! Rolos were my sister’s candy of choice growing up. I’m sure they taste as amazing as they look! 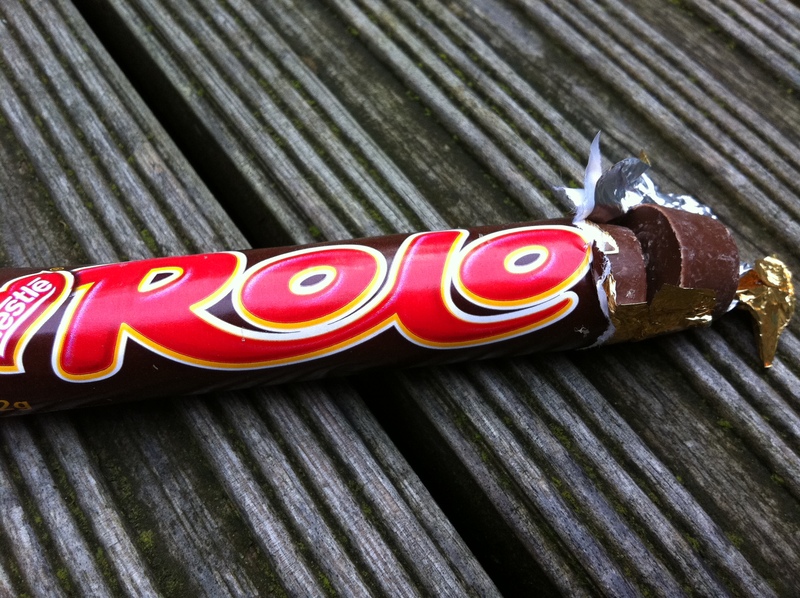 Oh dear, bot having grown up in the UK, I’ve never had a Rolo…perhaps I will have to steal your last one? Or even better, maybe I will take a spoonful of this lovely concoction. Swoon! 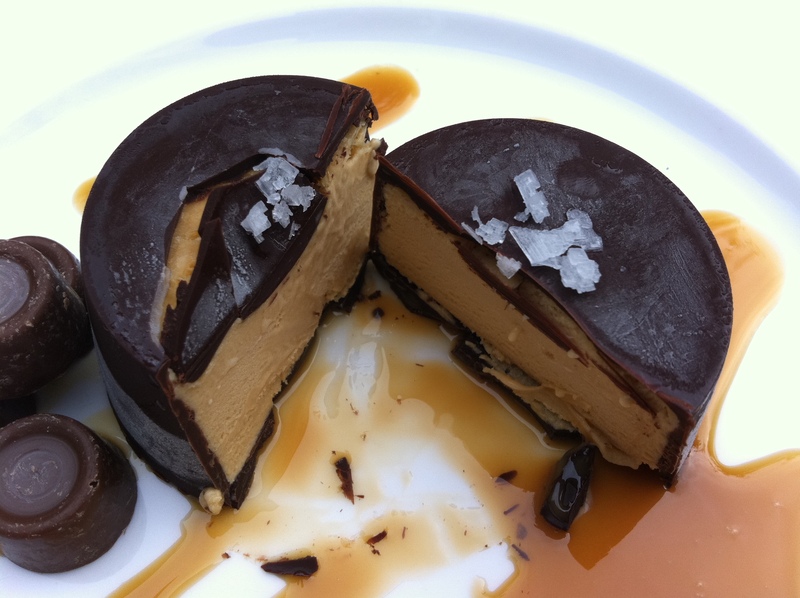 The first ice cream I ever made was this salted caramel number by David Lebovitz. It is amazing and actually very easy. There are no words for how awesome this is. No words at all. Oh WOW. These are just brilliant. I loved rolos as a kid! And these rolo ice cream cups look like what I would love as an adult. I am such an idiot, before I got to the instructions I was thinking “but how did you dip the ice cream in melted chocolate without it turning into a big mess?”, haha. Wow. Like a choc ice but prettier and no doubt infinitely tastier! Amazing. Miss South – I remember reading your salted caramel ice cream post – I think it may even have been before I owned a copy of The Perfect Scoop! Julia – thank you. I’ve got a couple more ideas up my sleeve so watch this space! I love rolos! And I love ice-cream so this is a lovely treat! Mmn, thanks for sharing. I NEED THIS IN MY LIFE. NOW. But, failing that, thank you for sharing this recipe for what can only be described as the food of the gods. wuuuh… is this for REAL? i hope someone loves me enough to make it for me. This is my dream dessert! I would thumb someone my last rolo and keep this all for myself! Eloise – thank you 🙂 Sadly I don’t sell any of what I make (yet…! ), but hope you enjoy making it for yourself! The Wobbling Goblins – haha, subtly wave the recipe in front of a loved one and maybe they might! littleloaf, what a great idea! and your post makes me want to eat rolos! or make this scrumptious ice cream! I havent had a Rolo for ages! These Rolo cups look amazing, very elegant looking too. Ohm nom nom. I love rolos. I’ve definitely saved my last rolo to give to someone special before – you’re right about chocolate being sold on sentiment. It’s an interesting thought. 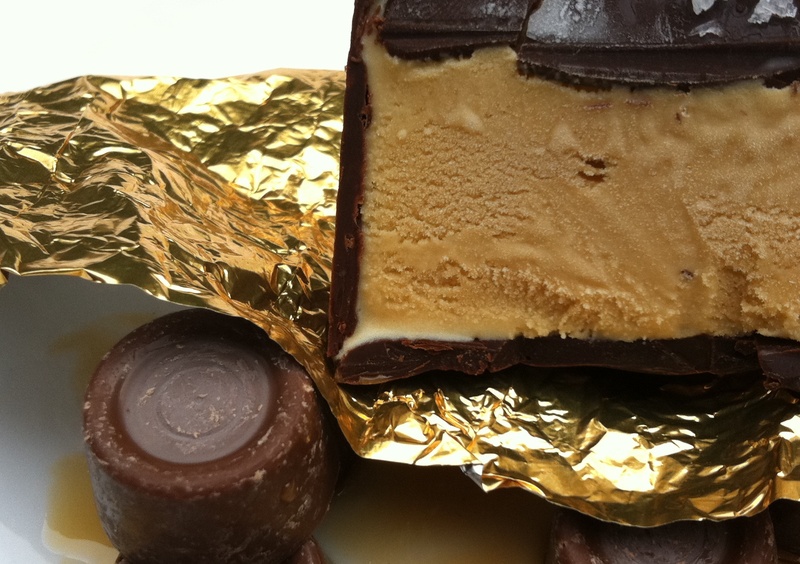 Another fantastic post and I’d rather have your rolo ice-cream any day than the real thing. That nostalgia is an interesting thing. I generally try not to buy from the big boys, but sometimes nothing will quite do except a twix- which was my go to chocolate bar when I was growing up. Awesome post! I, for one, would be smitten if someone were to give me their last Rolo and not a fancy truffle of some sort. I like the homeyness, and Rolos have always been a weekness. I love the way you write – it’s very elegant. Great read and great recipe! Yudith – so glad you like it, and hope your husband does too! Mandy – thank you. I love the joy of rediscovering childhood favourites. Emma – there’s something about saving and sharing food with someone you love that makes it extra special. Lovely recipe – I always remember a tube of rolos being one of the highlights in my christmas selection box! OMG This looks scrumptions! I love reading your adventures in baking & making delicious food. Gorgeous looking ice cream- and no, I definately wouldn’t share my last Rolo!! Old fashioned or not, I love them! These look amazing!!!!! I am making them today! Just wondering about the amount of butter in with the chocolate? The ingredients list says 100grams but the directions say 125grams for the first part? I can not wait to look through all of your recipes to see what else I can make. What a discovery!!! Thanks Amy – and you’re absolutely right, it was a typo. I’ve amended to 100g throughout now, but to be honest the 25g shouldn’t make much difference…they will still taste delicious either way! This looks amazing, but making my own ice cream always seems so daunting. I’m content to drool over these pictures. Dying to eat a rolo gone ice cream! How can I convert to US measurments? Hi Eileen, I don’t have conversions on my blog but you can find a really helpful one here http://cafefernando.com/conversion-tables/. Other than that, I highly recommend getting some digital scales – they’re cheap and so much more accurate than cups.